Like everyone else in America today, my stomach is knotted and my eyes sting. We’re raw. Stretched to the breaking point as a nation. We want explanations, we want the names of those responsible, and we want the power to hurt them as much as they’ve hurt us. We want to make them pay for making us afraid for our children, for making us close our airports, for changing our lives so dramatically. We’ve had more than enough. Our collective soul has had more than its fill. And because we’ve had more than enough, we react. We lash out in anger. Since we don’t know who to blame or how to get to them, we transfer blame to people closer to home. We see people celebrating our tragedy on the other side of the world and we lash out at people like them here. We give in to prejudice, anger, and hate. We’re ruled by fear and anxiety. A lot of times when I read something I’ve written in response to then-current events, I feel a little embarrassed. Time passes, my perspective changes, and I wish I hadn’t used the words I used, or had used different ones. Sometimes I even think that maybe I shouldn’t have written about the events at all, that they turned out to be not worthy of the attention. Sometimes, but not this time. After ten years, two wars, and the deaths of several people behind the attacks on the World Trade Center and the Pentagon, I still have some of the same feelings. And I don’t think I’m alone. Frankly, it’s not something I want to commemorate. Oh, I’m sure it’s a good thing that we do. The people who died in the attacks deserve that. The first responders who rushed into the burning towers without even considering the possibility that they might collapse deserve it. The passengers on flight 93 who died saving other lives deserve it. So do the families and friends of the dead and the soldiers who have served and died in America’s subsequent wars. For their sake, it’s good to remember. In some ways, though, for the last ten years it’s felt like we as a nation have danced while al-Qaeda have pulled our strings. The lives lost - both American and not so - the increased security, the stricter state laws regarding immigrants, haven’t made us more secure. Not really. The military flexing of muscle the US has indulged in over the last decade has not made us more respected internationally. Oh, I suppose it’s a political necessity for those who govern to respond in those ways to the kind of provocation visited on us on September 11 ten years ago. It can even make us feel better, to some degree. Unfortunately, it only feeds the cycle of violence. Today in New York, security is tight in the wake of further threats. In communities all over the nation, questions are flying about where Muslims will be allowed to worship and how immigrants in general are to be treated. No one would argue that we’ve won what we’ve chosen to call “the war against terror.” And someone will have to explain to me sometime how Afghani and Iraqi civilians killed by US missiles and bombs are different from American civilians killed by hijacked airplanes. About two thousand years before September 11, a young man died as a victim of state-sponsored terrorism. He died bleeding and writhing on a cross while ignorant people mocked his trust in God. He died because he claimed that God’s kingdom had come, and that it would subvert and eventually topple the kingdoms in Rome and Jerusalem propped up by war and violence and power. But he died with a prayer of forgiveness on his lips, asking God to show mercy on those who didn’t know enough to recognize him for who he was. Resisting would only feed the terror of sin and death. Fighting would only contribute to the cycle of violence. So he took the worst evil his tormentors could do to him, let them torture him to death, and prayed that God would forgive their sin and excuse their ignorance. Surely the story of this young man was on Paul’s mind thirty years or so later, when he told a community of people who followed the young man to “overcome evil with good.” He told them they should be at peace with everyone, if they could. To forego the right to revenge against those who might hurt them. To treat their enemies, in fact, with basic love and care. To act in the face of evil in the same way the man who they followed acted: with love, and forgiveness, and trust in the Lord. And surely this story still means something to us, especially on a weekend full of memory. 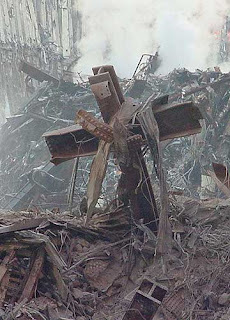 It won’t do to say that the forgiveness and trust Jesus demonstrated on the cross has nothing to do with international terrorism. I would argue that it has especially to do with international terrorism. The forgiveness, love, and trust of those who follow Jesus means nothing if it isn’t worked out in individual relationships, as we learn to know and understand and show the grace of God to those who are different from us. But we must also contribute to city, county, state, and federal governments that have no idea how to address complex issues like immigration, national security, and international diplomacy with justice, righteousness, and peace. It’s complicated, of course. But it begins with this. It begins with a prayer of forgiveness, and with trust in the God who raised Jesus from the dead. We whisper a prayer of forgiveness for those who have wronged us. We love those around us, even if it kills us. And we entrust ourselves to God. And there is no evil, in this world or any other, that can overcome that.